It's official: the Oscars are staying in Hollywood. Same location: Hollywood and Highland. New name: The Dolby Theatre. The Academy, along with theater owner CIM Group, announced Tuesday, May 1, that the Academy Awards will remain in Hollywood under a new 20-year deal. In a separate agreement, announced at the same time, Dolby Laboratories, Inc. and CIM announced a 20-year naming agreement for the theater home to the Oscars: The Dolby Theatre at the Hollywood & Highland Center (formerly known as the Kodak Theatre). It's official: the Oscars are staying in Hollywood. Same location: Hollywood and Highland. New name: The Dolby Theatre. The Academy, along with theater owner CIM Group, announced Tuesday, May 1, that the Academy Awards will remain in Hollywood under a new 20-year deal. In a separate agreement, announced at the same time, Dolby Laboratories, Inc. and CIM announced a 20-year naming agreement for the theater home to the Oscars: The Dolby Theatre at the Hollywood & Highland Center (formerly known as the Kodak Theatre). Under the new contract, the Dolby Theatre will host the Academy Awards through 2033. The Dolby will be "a showcase of technology innovation," according to the press release. During the term of the naming agreement, which begins this summer, Dolby will update the theater, keeping it state-of-the-art. For starters, its recently released Dolby Atmos sound technology will be immediately installed. Financial terms for either agreement were not disclosed. 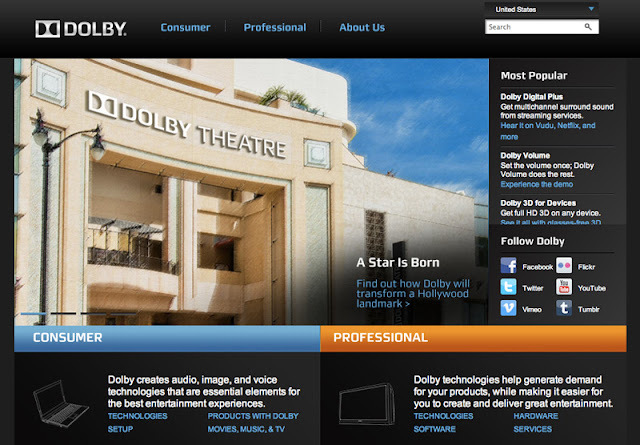 Bloomberg first reported news of a possible Dolby deal on March 29. "Any deal could be complicated because the Academy of Motion Picture Arts and Sciences, which puts on the annual awards show, is in negotiations to renew its pact to stage the Oscars at the venue," the financial news service reported. In the December, the Academy exercised a clause in its contract with CIM to possibly leave its current Oscars venue, instead of automatically renewing its contract for eight more years. It was seen as a negotiation tactic, rather than a declaration of wanting to leave. Academy President Tom Sherak told various news organizations at the time that he would prefer to stay at the then-Kodak Theatre and wasn't negotiating with any other venues. And the Academy decided to stay after all — for 20 more years. Shortly after the announcement, Deadline reported that Dolby's name will remain on the theater as long as its the home for the Oscars. There is an opt-out clause in its 20-year contract with CIM if the Academy ever decided to pull the show from the theater. "As long as the Oscars are there, the Dolby Theatre will be there," said Ramzi Haidamus, Dolby Laboratories executive vice president of sales and marketing, on May 1, in a conference call announcing the deal. The 85th Academy Awards are scheduled for Sunday, Feb. 24, 2013. Just a decade after the opening the christened Kodak in Hollywood, The Eastman Kodak Co. received court approval on Feb. 15 to end forthwith its sponsorship deal with the 3,332-seat theater at Hollywood & Highland Center. 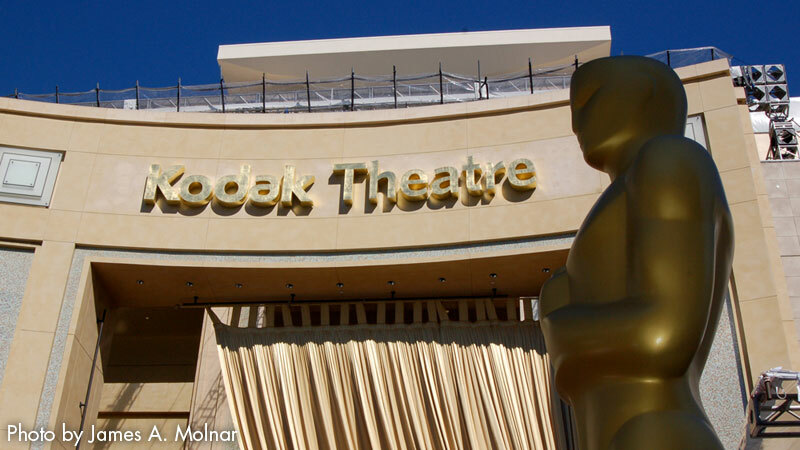 The 84th Academy Awards, on Feb. 26, were broadcast live "from Hollywood & Highland Center." Host Billy Crystal referred to the venue as the "Chapter 11 Theater" during his opening monologue. Built at a cost of $94 million and opening on Nov. 9, 2001, the Kodak was the place to be. Concerts, awards shows and finales for “American Idol” were held there before the Nokia Theatre at L.A. Live — opening in October of 2007 with 7,100 seats — crashed the party and replaced the Kodak as the broadcasting hot spot. But it was not all doom and gloom for the Hollywood theater. Last September, Cirque du Soleil became the permanent show at the theater when it premiered "Iris" (it made a special appearance at this year's ceremony). Presented 368 times per year for 10 years, "Iris" was on hiatus while the Oscars took over the theater, but returned on March 24. The show even modified the auditorium and the 9,600-square-foot stage. Cirque du Soleil needed two lifts built, with a price tag of $40 million. To accommodate these lifts, 44-foot deep pits were excavated out, making the vertical space 122 feet. Cirque also removed seating from the theater, reducing seating to 2,500, in order to give all audience members the same viewing experience.